Final Fantasy XIV is a multiplayer online role-playing video game, it has accompanied us over seven years, and now is 2018! At this time, the video game's producer and director Naoki Yoshida, aka Yoshi-P, announced the coming of patch 4.2 as well as another Fan Festival. "2017 was a fantastic year. The release of our second expansion, Stormblood, was a great success, and we've seen more players online than ever before... 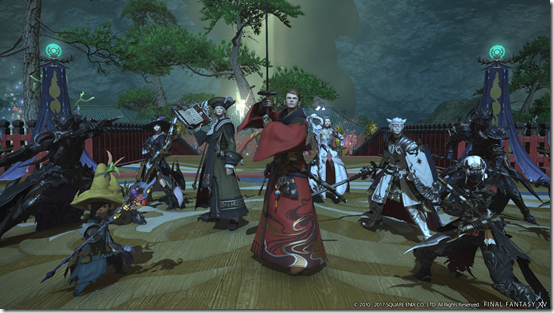 I can't thank you enough for your continued patronage," Yoshi-P wrote in this blog post. The new expansion pack of the video game "Stormblood" received a 9.2 out of 10 score from IGN. The update was applauded for its additional storyline to the video game and new dungeons and primal fights. The first expansion pack of the video game, "Heavensward," also got impressive score from critics. The developer then mentioned the major patch will be released this January. Another "Final Fantasy XIV" Fan Festival is also on its way. Yoshida did not disclose any further information about the anticipated festival for 2018 and 2019. He wrote, "I'm afraid you'll have to wait to learn what we have in store." Yoshida then teased fans with something he calls "prophetic message," which is actually a teaser for a new content for the game. The message reads, "As destiny is the whim of gods, so history is the whim of men. How the fallen rise and risen fall. All shall be the subjects of my pen." Yoshida then followed the message with "Strange... I was expecting perhaps another ancient Eastern proverb, or even a passage from the diary of the late Archon Louisoix." The FFXIV development team are in the middle of vacation according to his post and will resume work upon their return.